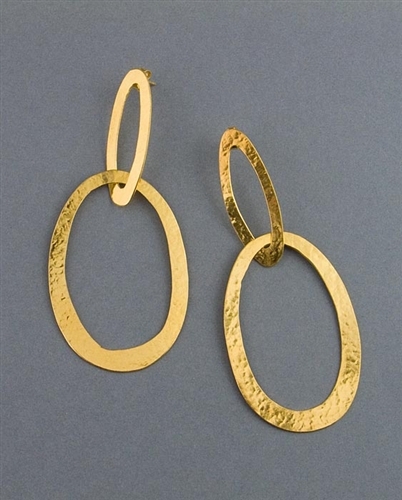 24karat gold vermeil gold drop earrings by Herve Van Der Straeten. This unique pair of earrings has been created with two interlocking gold ellipses, casting a subtle glow around your face. Earrings come with post backs. and drops 8.2cm (3.2") in total. A unique pair of designer earrings easy to wear from day to night, adding a touch of glamour to any outfit. Also makes a perfect gift.